The CDA AS1WH is a single bowl, composite sink in white. It is scratch, stain and heat resistant to withstand tough use in the kitchen and its finish and design are both elegant and sleek, complementing your modern kitchen perfectly. 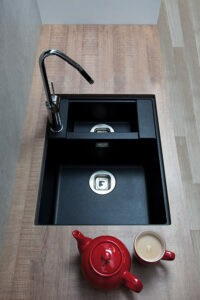 The KG43BL is a single bowl composite sink in anthracite. It is made from tough granite/ quartz and is incredibly robust yet has the finest smooth metallic surface finish, resulting in a practical and highly attractive sink. The KG44BL is a one and a half bowl composite sink in anthracite. It is made from tough granite/ quartz and is incredibly robust yet has the finest smooth metallic surface finish, resulting in a practical and highly attractive sink. 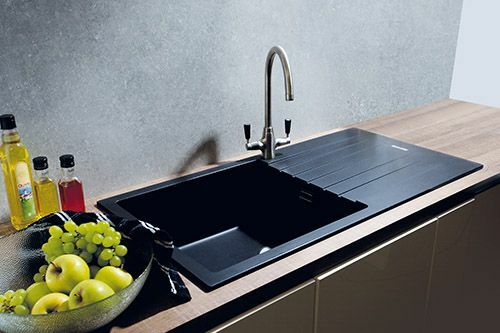 The KG73BL is a single bowl composite sink in anthracite. It is incredibly robust yet has the finest smooth metallic surface finish along with a smooth-fit edge that allows you to clean surfaces more effectively, resulting in a practical and highly attractive sink. The KG73GR is a single bowl composite sink in graphite. It is incredibly robust yet has the finest smooth metallic surface finish along with a smooth-fit edge that allows you to clean surfaces more effectively, resulting in a practical and highly attractive sink. The KG74BL is a one and a half bowl composite sink in anthracite. It is incredibly robust yet has the finest smooth metallic surface finish along with a smooth-fit edge that allows you to clean surfaces more effectively, resulting in a practical and highly attractive sink. The KG74GR is a one and a half bowl composite sink in graphite. It is incredibly robust yet has the finest smooth metallic surface finish along with a smooth-fit edge that allows you to clean surfaces more effectively, resulting in a practical and highly attractive sink. 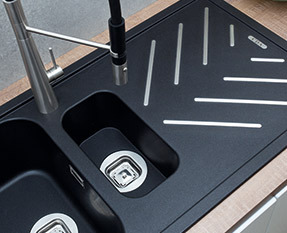 The KG81GR is a single bowl composite sink in graphite. It features integrated stainless steel drainer strips that act like a built-in trivet, providing a practical heat resistant surface for hot pans as well as an additional aesthetic detail to match black and stainless steel appliances. The KG82BL is a one and a half bowl composite sink in anthracite. It features integrated stainless steel drainer strips that act like a built-in trivet, providing a practical heat resistant surface for hot pans as well as an additional aesthetic detail to match black and stainless steel appliances. The KG82GR is a one and a half bowl composite sink in graphite. It features integrated stainless steel drainer strips that act like a built-in trivet, providing a practical heat resistant surface for hot pans as well as an additional aesthetic detail to match black and stainless steel appliances. The KMG31BL is a one and a half bowl composite sink in anthracite. This sink features a full depth half bowl allowing you to make the most of your sink, made from tough granite-quartz this sink is incredibly robust yet has the finest smooth metallic finish, resulting in a practical and highly attractive sink. The KMG31GR is a one and a half bowl composite sink in graphite. This sink features a full depth half bowl allowing you to make the most of your sink, made from tough granite-quartz this sink is incredibly robust yet has the finest smooth metallic finish, resulting in a practical and highly attractive sink. Tough, modern and virtually indestructible, the composite range offer solid style and contemporary practicality that will look perfect even when full of washing up. We have options in cream, white, anthracite or graphite that will complement your kitchen style. Choose the bowl option that will work best for you and fit your kitchen space. We have options with single deep bowls, bowl and a half, two full double bowls and square bowl designs that can be installed into your worktop. We understand that no two kitchens are the same. To help you decide on the shape and size of your sink we have created a sink size guide for you to go through the options available and the thought behind creating the different styles. There is also a complete advice section, buying advice – sink materials, that compares and contrasts the different properties and benefits of each sink material available to you in the CDA range. Composite sinks are a great range for people who need their sink to work extremely hard, be resistant to scratches, stains, heat and impact damage. Take a look at the video above to discover more about the composite material’s features and benefits. Special design features like the drainer rivets on the KG81 and KG82 range demonstrate how something that has a practical function can still be stylish. These rivets are designed for hot pans and also work as an extra design aesthetic in your kitchen, especially if you have elements of stainless steel elsewhere in your kitchen. You can choose between the rounded edge designs or the squares off bowl shapes, depending on your preference and pair your sink model with any one of our modern chrome taps. These sinks lend themselves perfectly to the design taps in our range with their angular shapes and features. Whether you want an overmount sink with a draining board or an undermount model for a flush design, you can find it in the composite collection. Click here to read more on what undermount sinks mean for practicality, style and your kitchen. Some of our composite models have built-in antibacterial properties in their material. These naturally repel and inhibit the reproduction of bacteria, creating a hostile environment for it to multiply and grow. This is great if you have a family and are concerned about creating a hygienic and safe environment for them to grow up in. We also have hints and tips to help you keep the busiest area of your kitchen as clean as possible with our sink cleanliness guide, click here to read in full. Take a look at our accessories for sinks including waste disposer units that can be installed beneath the worktop to get rid of organic matter safely from your kitchen or space saving plumbing packs to make the most of compact cupboard spaces and fit awkward spaces. Whichever composite model you go for, they are reversible for easy and flexible installation, practical to use, family-friendly and are fitted with our new square design strainer wastes as the perfect finishing touch.